Since 2012, SpaceScout has helped students “find the perfect place to study.” Now, with a new name—Scout—the app has enhanced offerings, thanks to generous renewed funding from the Student Technology Fee (STF) Committee and to its deep insight into student needs. 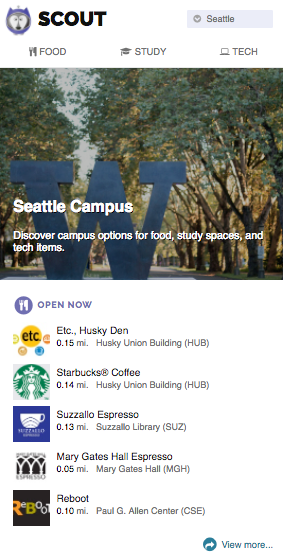 Now, in addition to finding study spaces, Scout also helps users locate campus dining options and technology items. Looking for a room to fit a study group of 10? A space with natural lighting, close to food, and absolute quiet? Got a craving for a late-night meal? Need a camera for a class project? 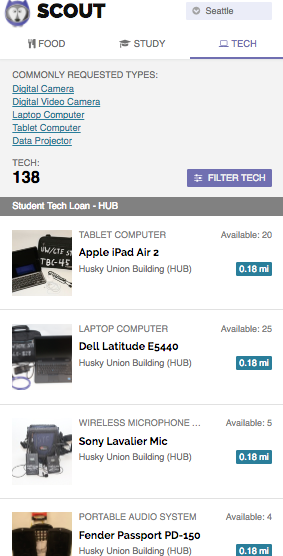 Scout includes over 200 study spaces on the UW Seattle campus, 70 study spaces at UW Tacoma, 60 study spaces at UW Bothell, 50 places to grab food, and 130 tech items for check-out. While developed with student needs in mind, Scout is available to help anyone in the UW Community find what they are looking for at scout.uw.edu. Scout is currently available as a mobile-optimized web application accessible from any desktop computer or mobile device. Both native iOS and Android versions will be available soon.